The LENAPE North American Natives (Oghuzian Peoples) and Their Ancient Turanian Identity. In this study, we want to examine some terms and names that are used to describe THE LENAPE Native peoples who call themselves by the name ANİSHİNABEG. The Lenape people were OGUZIAN Turks. The name OGUZIAN is made up from the Turkish name OGUZ plus the Turkish plurality suffix AN - like the presently used LER/LAR suffix. Thus, the name OGUZIAN is the same as the Turkish name OGUZLAR meaning the ancient Turanian “Tur/Turk/Oguz people”. Prof. C. S. RAFINESQUE, AM, Ph. D., talks about them in his book entitled “Ancient History, or Annals of Kentucky, 1824” (With a Survey of Ancient Monuments of North America and a Tabular View of the Principal Languages and Primitive Nations of the Whole Earth) pages 23-25. He reports the presence of OGUZIANS in North America since some 2000 years ago. The so-called LENAPE people were ancient TuranianTur/Turk/Oguz people, like many other North American Natives were! They had a common language which bound them to each other as Turanians. 1. The Wikipedia link https://en.wikipedia.org/wiki/Lenape provides the following information regarding the “Lenape” natives of North America who are also called Delaware Indians. Most Lenape were pushed out of their Delaware homeland during the 18th century by expanding European colonies, exacerbated by losses from intertribal conflicts. Lenape communities were weakened by newly introduced diseases, mainly smallpox, and violent conflict with Europeans. The map below shows their present distribution of the THE LENAPE NATIVES in North America. 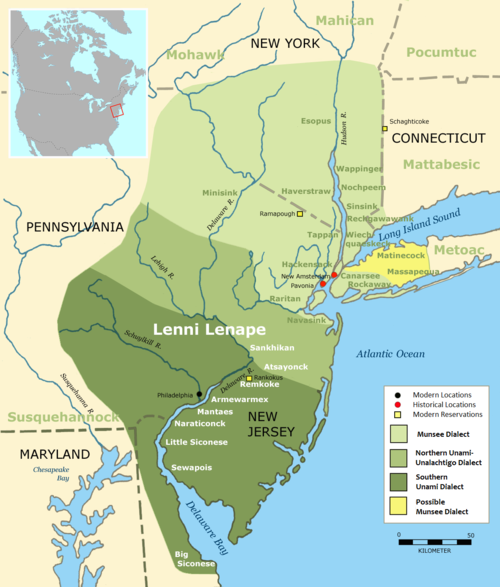 Lenni-Lenape name (or Lenni-Lenapi) comes from their autonym, Lenni, which may mean "genuine, pure, real, original," and Lenape, meaning "Indian" or "man". (cf. ANİSHİNAABE.) Alternately, lënu may be translated as "man." The Lenape, when first encountered by whites, were a loose association of related peoples who spoke similar languages and shared familial bonds in an area known as LENAPEHOKİNG, the Lenape traditional territory, which spanned what is now eastern Pennsylvania, New Jersey, southern New York, and eastern Delaware. The tribe's other name, "Delaware," is not of Native American origin. "MOTHER" was ANNA, "brother" was "İSSEEMUS," "friend" was NETAP. Penn instructed his fellow Englishmen: “If one asks them for anything they have not, they will answer, mattá ne hattá,” which to translate is, not I have, instead of I have not." Anishinabeg "Ann-eh-shin-ah-beg" This is the word that we call ourselves. Generally, it is reserved for Anishinabe people to refer to themselves, although there are some that would rather be known by this name. Actually, the Anishinabe are also people that live in our creation stories. They are the original people and were very weak. One meaning is "original people as opposed to those other people who came later.” Another meaning is "Original people meaning creators, as opposed to those who cannot create". Connotations of the first meaning are that the "original people" came down from the sky. There is a need to understand “Where did we come from? How did we get here?” Then you need to understand our history. It was not until recent that it has been written down. Polat Kaya: In the above given information, there are a number of names which are extremely important in identifying these native peoples of North America. a) The name ANİSHİNABEG: supposedly an original native name, is not the original “native” word as they would like the world to believe, but rather is a rearranged name made up by way of anagrammatizing a Turkish expression that defines and describes the identity of these native people - but in Turkish. This we see when the name “ANİSHİNABEG” is diciphered as “İNSAN-BEGHİ-A”. This decipherment reveals the Turkish expression “İNSAN BEĞİ O” meaning “He is Human Lord, He is Man Lord, He is Noble Man, He is Lord of Man” all of which identify them as a lordly and noble people. In this decoding into Turkish, the Turkish word İNSAN means “man”, BEĞ means “Lord, noble person”, Omeans “he/she/it”. We must note that The Lenape Natives also say that their identity means “man” which is attested by my decoding above! Additionally, the name ANİSHİNABEG also has embedded in it the Turkish saying “AN İSHİAN BEG” which means “The Shining Lord of Sky”. This title name is due to the fact that they were Sun worshipping people of ancient Turanian Tur/Turk/Oğuz peoples. Turkish word AN means “Sky”, İSHİAN means “shining” which refers to SUN and BEĞ means “Lord, noble person”. Thus, the Native Algonquian peoples essentially identify themselves with these Turkish words. It is interesting to note that when these three Turkish words AN, İSHİAN and BEG are concatenated together, as ANİSHİANBEG, we get the word that the Algonquian peoples identify themselves with! This decipherment identifies them as groups of ancient Turkish speaking Turanian Tur/Turk/Oguz peoples who came to North America from Asia. Clearly, the most wide spread Natives of the Amer’can continents have been the Tur/Turk/Oguz peoples contrary to all the intentional denying, disguising, confusion and covering up efforts by the invaders. It is curious that the term “INDIAN”, when deciphered into Turkish as “İNDİ-AN”, reveals the Turkish saying “İNDİ-AN” which means “came down from Sky”. Turkish word İNDİ means “came down” and AN means “sky”, (additionally, AN also means “time” and “plurality suffix”). This creates additional linguistic kinship to the Turkish language! b) The name “LENAPEHOKING”, given in the Wikipedia citing, refers to the original Lenape Territory (Lenape Country) and thus, is a name that identifies the original name of their land. The name LENAPEHOKING appears to be an intentionally structured word to make it appear as if it was the original form of the name of their Native land. Yet, LENAPEHOKING appears foreign to any known languages. This supposedly native name “LENAPEHOKING” is an altered name made up by way of anagrammatizing a Turkish expression defining the name of the Native Land. The name “LENAPEHOKING”, diciphered as “KONHAN-PEG-ILE”, reveals the Turkish expression “GÜNHAN BEY İLİ” meaning “The country of Sun-God Lord Günhan, The land of Sun-God Lord Oguzhan”. This decoding of the name LENAPEHOKING identifies this land of the Native People of the North American First Nations as Sun-God worshipping Turanian Tur/Turk/Oguz peoples. Turkish name GÜNHAN means “Sun God, Sun Lord, Oguz Lord”, BEĞ means “Lord, noble person”. c) Interestingly, the name “LENAPEHOKING” is also the source for the made-up name of “ALGONQUIAN” as well. This we see as follows: When the name “LENAPEHOKING” is diciphered letter-by-letter as “ALGONKIEN-PEH”, it reveals the Turkish expression “ALGONKIEN-BEĞ” meaning “Algonkien Lord”. Thus, we see that the word ALGONQUIAN is also embedded in the name LENAPEHOKING and it is none other than the word ALGONKIEN in my decipherment. Hence, we see that both the LENAPEHOKING and ALGONQUIAN are made up from the Turkish expression “GÜNHAN BEY İLİ” as explained above. It is clear that a lot of alteration activity has been performed in fabricating words in order to alienate the Turanian Turkish language of the Native Americans and their Turanian and Oguzian identities, throughout the North, South and Central Americas! In other words, the priest missionaries went to a lot of effort to distort the LENAPE peoples’ words so that they lost their original Turanian or Oguzian identity. Thus, we see that the names LENAPEHOKING and “ALGONQUIAN” were made up to replace the name OGHUZIAN. Here, the term UNALİCHTİGO is meaningful and important as it identifies the name of the language that these First Nation Natives were speaking. But, this term UNALİCHTİGOis not a native name. It is a concocted name that has been made up artificially from a Turkish expression defining the original identity of the language they spoke. In this context, when the name UNALICHTIGO is diciphered letter-by-letter as “GUN-TİLCHA-Oİ”, it reveals the Turkish saying “GÜN DİLÇE ÖY” (GÜNEŞ DİLÇİ ÖY) meaning “Sun Language speaking House”, that is, “House of Sun Language Speakers, House of Turkish speakers”. This identifies that these Native Americans, so-called “LENNİ-LENAPE”, were actually a “SUN-LANGUAGE” speaking people contrary to all kinds of alterations, confusion and cover up intended to obliterate their real and ancient Turanian identity. e) In the reference above, we are told that: William Penn, who first met the Lenape in 1682, stated that the Unami used the following words: "mother" was ANNA, "brother" was "isseemus," "friend" was netap. Penn instructed his fellow Englishmen: “If one asks them for anything they have not, they will answer, mattá ne hattá,” which to translate is, not I have, instead of I have not." Here we note the term ANNA for mother! This word for mother is purely the Turkish word ANNA (ANNE or ANA) meaning “mother”. This is another linguistic evidence that these First Nation peoples were originally Turkish speaking ancient Turanian Tur/Turk/Oguz peoples - contrary to all of the linguistic alterations, religious and Aryanization efforts intended to obliterate their ancient noble identity, their Sun language, their Sun-God religion and their culture and civilization! f) In the above reference, we are told that: “the Unami word for "food" is MAY-HOE-ME-CHİNK”. When the Native term MAY-HOE-ME-CHİNK is diciphered letter-by-letter as “YEMEK CHİNAMA OH”, it reveals the Turkish saying “YEMEK ÇİĞNEME O” meaning “it is chewing food”, that is, “it is eating food”. Turkish word “YEMEK” means “food; to eat; to chew”, ÇİĞNEME means “chewing” and O means “he/she/it”. So, even in this decoding of the Native expression MAY-HOE-ME-CHİNK , we find three Turkish words that are related to the meaning of this Native expression. This correspondence can not be due to coincidence, but rather is from the linguistic kinship between Turkish and the native languages. Polat Kaya: These two Native ladies (said to be “mother and daughter”) are very much Turkish women in their clothing and ornaments around their necks and elbows. Furthermore, their shoes are just like the Turkish ÇARIK. Additionally the carpet designs are also the same as in some Turkish carpet designs. This background information also identifies these Native Americans as Turanian and Oguzian people. Polat Kaya: The outer clothing on this Native lady is a form of the Turkish KEPENEK. Furthermore, her shoes are Turkish ÇARIK. These make her not only Asiatic but also Turkish! KEPENEK is an outer wear, normally worn by shepherds in Turkiye, which is made up from felt, is seamless and sleeveless. For the shepherds, it is a warm protection from the cold of the mountain night and is also a sleeping bag. The one in the picture, most likely is woollen and is a much thinner and finer material designed for women to wear. But, it is still the same design. The artistic designs on it are Turanian! “Algonquian languages (/ælˈɡɒŋkiən/ or /ælˈɡɒŋkwiən/; also Algonkian) are a subfamily of Native American languages which includes most of the languages in the Algic language family. The name of the Algonquian language family is distinguished from the orthographically similar Algonquin dialect of the indigenous Ojibwe language (Chippewa), which is a senior member of the Algonquian language family. The term "Algonquin" has been suggested to derive from the Maliseet word elakómkwik (pronounced [ɛlæˈɡomoɡwik]), "they are our relatives/allies". A number of Algonquian languages, like many of the Iroquoian languages of the hereditary enemies of the Algonquian peoples, have already become extinct. Polat Kaya: The Ojibwe (Chippewa) language, which is said to be a senior member of the Algonquian language family, is an altered form of a Turkish saying. When the term CHİPPEWA (where W is a representation of YU) is rearranged as “ECH-PPA-UYI”, it reveals the Turkish saying “EÇE PAPA ÖYİ” (EÇE BABA ÖYİ) meaning “House of Elder Father”. Thus, the so-called name CHİPPEWA (OJİBWE) is actually an altered form of this Turkish saying that describes Ojibwe (Chippewa) people as the “older house of Father Oguz people” and their language “a senior member” of the Algonquian or the Oguzian language family! Turkish word EÇE means “elder”, BABA means “father” and ÖYİ means “home; house”. The linguistic classification of the so-called Algic Language Family is said to be “One of the world's primary language families”. These languages, being the language of the ancient Turanian Tur/Turk/Oguz peoples who believed in the Sky-God, Sun-God and Moon-God concepts, were named as the SUN LANGUAGE (that is, the TURKISH language, which was spoken world-wide and all other languages were made from it) would fittingly be called the “PRIMARY” language of them all! The Aryanized term ALGONQUİAN represents both the ALGONQUİAN people, that is, the OGHUZIAN people, and also their original language. In this context, when the name ALGONQUİAN is deciphered as “AL-QUNGIAN-O”, it reveals the Turkish saying “AL GÜNCİAN O” (AL GÜNCİLER) meaning “they are Red Sun believers”; and also “they are Sun-Language speakers”. In the map given above, all areas indicated by red, shows the distributions of the Algonquian languages, that is, the OĞUZİAN, that is, the TURKİSH language family! Note: Please note that the following list of OJİBWE words are the results of my deciphering them into Turkish with given meaning attributed to each OJIBWE word – rather than translating them into Turkish..
1. AHNUNG (meaning star), rearranged as “GUNHAN”, reveals the Turkish saying “GÜNHAN” (GÜNLER, GÜNEŞLER) meaning “Sun-Lord; suns; stars”. 2. AHNUNGGOKWAN (meaning star world), rearranged as “U-GOK-HANU- GUNAN”, where W= UU, reveals the Turkish saying “O GÖKEVİ-GÜNAN” (O GÖK GÜNEŞLERİ) meaning “it is suns of the sky house”. Turkish word GÖK means “sky”, HANU means “big house”, GOK-HANU (GÖKEVİ) means “Sky house, sky dome”, GÜN means “sun”, GÜNAN means “suns”, O means “it is”. 3. AHSİNNEEG (meaning rocks), rearranged as “GAIHENSEN”, reveals the Turkish saying “GAYAENSIN” (GAYALARSIN) meaning "you are rocks". 4. AHSİN (meaning rock) is just the cut off front end of the term AHSİNNEEG meaning “rocks” shown above. 5. BANAYSHEUG (meaning birds), rearranged as “GUSH-BEYAAN”, reveals the Turkish saying “GUŞ BEYLERİ” (KUŞLAR) meaning “birds”. Also, BANAYSHEUG rearranged as “BAYGUSHEAN” reveals the Turkish saying “BAYGUŞLAR” meaning “The owls” - which are birds. 6. EKANDASOWİN (meaning knowledge), rearranged as “ADIN-OKUYANSE” where W = YU, reveals the Turkish saying “ADIN OKUYANCI” meaning “your name is he who reads”. Turkish word ADIN means “your name”, OKU means “read”, OKUYAN means “he who reads”, OKUYANCI means “he who is in the business of reading and studying”. 7. GEESİS (meaning sun), rearranged as “GEESSİ”, reveals the Turkish saying a) “KÖZ” meaning “shining fire”; and b) GÖZ meaning “EYE”. The SUN is both an eye in the sky and also a shining fire in the sky! 8. GİSİNAW (meaning cold) reveals the Turkish saying “KIŞIN HAVA” meaning “winter weather”. Turkish word KIŞ means “winter”, KIŞIN means “of the winter” and HAVA means “weather; air”. 9. GİZHİDAY (meaning hot), rearranged as “GAY-İZİDH”, reveals the Turkish saying “GÖY ISIDI” (HAVA ISIDI) meaning “weather got hot”. Turkish word ISI means “heat” and ISIDI means “it is heated up, it is hot”, GÖY (HAVA) means “sky; weather”. 10. ISHSKWADAY (meaning fire), rearranged as “U-KUY-ADASHI-S” where W=UU, reveals the Turkish saying “O GÖY ATAŞI” meaning “it is the fire of sky; it is the Sun”. Turkish word O means “it is”, GÖY means “sky” and ATAŞ means “fire”, ATAŞI means “the fire”. 11. KWAYZENHS (meaning girl), rearranged as “KEZ HANYM-S” where W= M, reveals the Turkish saying “KIZ HANUM” meaning “lady girl”. Turkish word KIZ means “girl”,HANUM means “lady” . 12. MİCHİ ZEEBEE (meaning greatest river), rearranged as “BEI-İCHME-ZEEE”, reveals the Turkish saying “BEY İÇME SUU” (BEY İÇME SUYU) meaning “the lord drinking water”. Water is a life giver element Turkish word İÇME means “drinking”, BEY means “Lord”, SUYU means “the water”. Water beıng a “life giver and supporter” element is indeed a life controlling “lord” consept! 13. MİSSKWA (meaning red), rearranged as “KISMUSU-A” where W = UU and R has become S, reveals the Turkish saying “KIRMIZU O” meaning “it is red”. Turkish word KIRMIZI means “red”! 14. MUKADAY (meaning black), rearranged as “KADAYUM” where letter R has been changed to D, reveals the Turkish saying “KARAYUM” meaning “I am black”. Turkish word KARA means “black”! 15. NEEBAGEESİS (meaning moon), rearranged as “NEBE-GEESSİ-A”, reveals the Turkish saying “NEBİ GÖZİ O” (TANRI GÖZİ O) meaning “it is the eye of God”. The termNEEBAGEESİS is a religious way of describing the “moon” in Turkish, rather than describing it with normal Turkish word AY! The term “GEESSİ” is the altered form of the Turkish word “GÖZİ” which means “the Eye” and it personifies the Sun and the Moon in Turkish. But in these cases, the SUN and MOON are regarded as “the Eyes of Sky God”. The name GOZ (GÖZ) is the name OGUZ which represents the ancient Turanian Sky-God TANRI, the Sun-God and the Moon-God. 16. NEEDONNİSUG (meaning brothers), rearranged as “ENNESİ-OGNUD” where G = Y, reveals the Turkish saying “ANNASI AYNUDU” (ANNESİ AYNIDI) meaning “their mother is same”. Surely, when two or more people have the same mother, they are brothers! Turkish word ANNA (ANNE, ANA) means “mother”, ANNASI means “his mother, their mother”, AYNU means “same”, AYNUDU (AYNIDI) means “is the same”. 17. NEEKONNİSİWİN (meaning brotherhood), rearranged as NEEKONNİSİWİN where W = YU, reveals the Turkish saying “İKSİNİN-ENE-OYNU”, or “İKİSİNİN ANA AYNU” meaning “the mother of two of them is same” (the mother of both of them is same). Turkish word İKİSİ means “two of them”, İKİSİNİN means “of the two of them”, ANA means “mother”, AYNU means “same”. 18. NEEZHODAY (meaning twin), rearranged as “EHEZ-DOYAN”, reveals the Turkish saying “İKİZ DOGAN” meaning “twin birth”. Turkish word İKİZ means “twins”, DOGAN means “who he/she is born”. 19. ODOİDAYMİWAN (meaning clan system), rearranged as “DOYAN-AWİMDİ-O”, reveals the Turkish saying “DOĞAN EVİMDİ O” meaning “it is my new born home”. This makes the new home of a son as the newly born home of the family! The term CLAN is the altered form of of the Turkish saying “OGLANAN” meaning “the Sons”. So this Ojibwe Language word is manufactured from Turkish language! Turkish word DOĞANmeans “that which is born”, EV means “home; house”, EVİM means “my home; my house”, EVİMDİ means “is my home; is my house”. 20. ODOON (meaning mouth), rearranged as “ODON-O”, reveals the Turkish saying “UDAN O” (YUDAN O) meaning “it is that which swallows, it is mouth”. Turkish word YUT means “swallow”, YUDAN means “he/she/it who swallows”. 21. OGEEBİCCOON (meaning roots), rearranged as “COCEN-OBEGİ-O”, reveals the Turkish saying “KÖKEN ÖBEĞİ O” (KÖKLER ÖBEĞİ O) meaning “it is plant roots that are bunched”. Turkish word KÖK means “plant root; family root”, KÖKEN (KÖKLER) means “roots”, ÖBEK means “group, bunched together, grown close by”. 22. OKAD (meaning leg), rearranged as “O KAD” where the D is a Ç, reveals the Turkish saying “O KAÇ” (O KIÇ) meaning “it is leg”. By the way, the English word LEG is also from Turkish word KIÇ where the K was upshifted to an L.
23. OKUNNUG (meaning bones), rearranged as “O-KUNNUG” where the NN is an M, reveals the Turkish saying “O KEMİK” meaning “it is bone”. 24. ONEEJAWİN (meaning womb), rearranged as “O-JANIN-EVUE”, reveals the Turkish saying “O CANIN EVÜ” meaning “it is home of life”. 25. OSKENZHİG (meaning eye), rearranged as “EKİ- GOZSHN”, reveals the Turkish saying “İKİ GÖZSİN” meaning “you are two eyes”. Turkish word İKİ means “two”, Gözmeans “eye”, GÖZSİN means “you are eye”. 26. OSTEGWAN (meaning head), rearranged as “EN–USTAGU-O”, where the W is a UU, reveals the Turkish saying “EN ÜSTEKİ O” meaning “the very top, the head”. Turkish word EN ÜSTEKI means “the very top”. 27. OZİD (meaning foot): OZID read backwards is the Turkish saying DİZ O meaning "it is knee". It seems that the word for foot (OZID) has been switched with the word for knee (DİZ O) in Turkish to cause extra confusıon so that people would not notice. 28. PAPAKOOSİGUN (meaning willow tree), rearranged as “PO-SUON-KAPAGI”, reveals the Turkish saying “BU SUYUN KAVAĞI” (BU KAVAK AĞACI SÖĞÜTGİLLERDEN olan uzun yapılı bir beyaz ağaçtır, UZUN KAVAK) meaning “this is willow tree by the water”. Grown nearby the water sources. Needs a lot of water to grow. Turkish word BU means “this”, SUYUN means “of the water, by the water”, KAVAK means “tall willow tree”. 29. WABİSKA (meaning white), rearranged as “AK-BİYAS-O”, reveals the Turkish saying “AK BEYAZ O” meaning “it is white white”. Turkish word AK and BEYAZ both means “white”! 30. ZAHGİDİWİN (meaning love), rearranged as “ZAVDİGHİİN-U” where the W is a VU, reveals the Turkish saying “SEVDİĞİN O” meaning “the one you love; the thing you love”. Turkish word SEV means “love”, SEVDİ means “he/she/it loved”, SEVDİĞİNmeans “the one you love; the thing you love”. 32. ZHEWİTAGANİBİ (meaning salt water), rearranged as “GUI-TENİZ-BUIA-AH” where B = C or S, reveals the Turkish saying “GÖY TENİZ SUYU O” (GÖK DENİZ SUYU O) meaning “it is the water of the blue sea”. But of course, the waters of the blue seas are “salt water” or “salty water”. Turkish word GÖY (GÖK) means “blue”, TENİZ (DENİZ) means “sea”, SU means “water”, SUYU means “the water”, O means “it is”. This decipherment is very strong correspondence in Turkish regarding the concept of “salt water” with this supposedly “Native ALGONQUIAN OJIBWE” language. When the native Turanian Tur/Turk/Oguz people migrated from Asia to North, South and Central Americas thousands of years ago, they were speaking the Turkish language with some dialectal variations. For example, one group may have said “salt water” as: “GÖY TENİZ SUYU O” (GÖK DENİZ SUYU O) or “GÖK DENİZ SUYU O”. But the anagrammatizer himself also knew Turkish as well and probably described the “salt water” concept in the same way, that is, “GÖY TENİZ SUYU O” - and then joined all of the Turkish words in this phrase to make up one word from them as “GÖYTENİZSUYUO”. To finish the job, he mixed up letters as he pleased and even changed some of the letters or dropped some out to get the so-called Algonquian word “ZHEWİTAGANİBİ”. Then, he declared to the new generations of the native people that this was a word that their Algonquian ancestors spoke originally. The young natives, who were being “educated” by the missionaries, readily learned these concocted words as their original language words. With this trick, the missionaries changed all of the original words and sentences and definitions used by the Algonquian Native peoples. The end result of all this was that the new generations of natives were trained to speak a newly fabricated language that was sold to them as their original language. And when it comes to describing the native people and their language to the world, the linguists and historians say that the natives were barbarians and that their native primitive language does not seem to resemble any known language – thereby conditioning the rest of the world to think that the natives were very primitive people – which is far from the truth! 33. WIIKWANDIWIN (meaning feast food; a feast), rearranged as “AYINİN-YIMIKUDU” where two of the W are YU and the third W is an inverted M, reveals the Turkish saying “AYİNİN YEMEĞİDİ” meaning “it is the food of the ritual”. 34. ONAAKONIGEWIN (meaning a decision, a policy, a law), rearranged as “GOI-EWİN-KANONI-A”, reveals the Turkish saying “GÖY EVİN KANUNU O” meaning “it is the law of Sky House”. 35. ATAASOWIN (meaning a place for storage, a cupboard, a closet, a bin), rearranged as “UYIN-OTASA-A”, reveals the Turkish saying “ÖYIN ODASI O” meaning “it is the (storage) room of the house”. OJİBWE (Chippewa) Rites of passage words where certain rituals are named? The Native terms GAAGAAGİİNH or GAAGAAGİSHİİNH (Raven Festival): One of the letter G in these words is bogus and it is a replacement for letter R. When the Native term GAAGAAGİSHİİNH is decıphered as “GAGA-GISHIN-AIANIH”, it is the altered form of the Turkish saying “GARA KUSH AYİNİ” which means “black Bird Festival”. Raven is a “black bird”. Turkish word for Raven is KARGA. Turkısh word GARA (KARA) means “black”, KUSH (KUŞ) means “bird” and AYİN (ŞÖLEN) means “festival”. Thus we find that this so called “word of the Native people” is actually a concoction of the Turkish saying “GARA KUSH AYİNİ”. Actually, believing in Black is an ancient religious belief of ancient Aryans. The Native Amer’cans were SUN and Sunlight believing people” and therefore, this “Black Raven festival” would be an alien tradition that was probably emposed on them by the invaders. In a second meanıng, when the term GAAGAAGİSHİİNH is deciphered as “GAGA-GISHIN-AIANIH”, it also reveals the Turkish saying “GARA KISH AYİNİ” (KARA KIŞ AYİNİ) which means “The Festval of cold winter days in January”. These cold vinter times are called “GARA KISH” (KARA KIŞ) in Turkish! Durıng this time of year, there are only Ravens (Kargalar) in villages trying to get some food. İn my village, (Suhara, Turkiye), there would be many Karga perching on trees and waiting to spot some food. 37. NITAAWIGIWIN (Birth rites)—ceremony in which a newborn's umbilical cord is cut and retained. NITAAWIGIWIN (meaning Birth rites), rearranged as “ANA-TUGIW-IYINI”, reveals the Turkish saying “ANA DOĞUM AYİNİ” meaning “it is the ritual of mother giving birth” and thus a birth rite. Turkish word ANA means “mother”, DOĞUM means “birth”,AYİN means “ritual”, AYİNİ means “the ritual”. 38. WAAWIINDAASOWIN (Naming rites)—ceremony in which a name-giver presents a name to a child. WAAWIINDAASOWIN (meaning Naming rites), rearranged as “AD-WONWASI-AYINI-AU", reveals the Turkish saying “AD KONMASI AYİNİ O” meaning “it is the ritual of giving name to baby” and thus naming rites. Turkish word AD means “name”,KONMASI means “the giving”, AYİN means “ritual”, AYİNİ means “the ritual”, O means “it is”. 39. OSHKI-NITAAGEWIN (First-kill rites)—ceremony in which a child's first successful hunt is celebrated. OSHKI-NITAAGEWIN (meaning First-kill rites), rearranged as “GEUK-OK -ATISHN-AYINI”, reveals the Turkish saying “GEyÜKe OK ATIŞIN AYİNİ” (GEYÜĞE OK ATIŞIN AYİNİ) meaning “the ritual of shooting arrow to dear” and thus first-kill rites. Turkish word GEYÜK means “dear”, GEYÜĞE means “to dear”, OK means “arrow”, ATIŞIN means “shooting”, AYİNİ means “the ritual”. 40. MAKADEKEWIN (Puberty fast rites). MAKADEKEWIN (meaning Puberty fast rites), rearranged as “UEKK-ADEM-AYIN”, reveals the Turkish saying “YEKE ADAM AYİNİ” (BÜYÜK ADAM AYİNİ) meaning “it is the ritual of growing into a big man”, that is, “the ritual of growing into adulthood”. Turkish word YEKE (BÜYÜK) means “big; adult”, ADAM means “man”, AYİNİ means “the ritual”. 41. WIIDIGENDIWIN (Marriage rites)—ceremony in which a couple is joined into a single household. WIIDIGENDIWIN (meaning Marriage rites), rearranged as “UYIIDIGENDIWIN” where the first W is a UY and the second W is an M, reveals “UI-EDINMG-IYNIDI” which reveals the Turkish saying “ÖY EDİNMeG AYİNİDİ” (EV EDİNMEK AYİNİDİ) meaning “it is the ritual of owning home”, that is, “it is the ritual of marriage” which is essentially “owning a home”. Turkish word for “marriage” is “EVLENMEK” or “ÖYLENMEK” which can be translated as “to end up with a home and a wife or husband in it”. Turkish word ÖY (EV) means “home; house”, EDİNMEK means “to own”, AYİN means “ritual”, AYİNİmeans “the ritual”, AYİNİDİ means “it is the ritual”. 42. BAGIDINIGEWIN (meaning Death rites—wake, funeral and funerary feast), rearranged as “GUE-GIDIN-AYINI-B” where W is a UY, reveals the Turkish saying “GÖYE GİDEN AYİNİ” (GÖYE UÇMAK AYİNİ) meaning “it is the ritual of that who goes to sky”, that is, “it is the ritual of that who flies to heaven”. Turkish word GÖY means “sky; heaven”, GÖYE means “to sky, to heaven”, GİDEN means “he/she/it who goes”, UÇMAK means “to fly”, AYİNİ means “the ritual”. ANİSHİNAABEG language, rearranged as “AN-İSHİAN-BEG” language, reveals the Turkish saying “AN IŞIYAN BEY DİLİ” (GÖK IŞIYAN BEY DİLİ, GÜNEŞ DİLİ) meaning “The Sky Shining Lord language”, that is, “the Sky Shining Lord language” which refers to “The Sun Language”. (GÜNEŞ DİLİ) is the TURKİSH language of the ancıent Turanıan Tur/Turk/Oğuz peoples! Turkish word AN (GÖY) means “sky; heaven”, IŞI means “light”, IŞIYAN means “that which shines”, BEY means “lord, master”, DİLİ means “the language”. 44. ANİSHİNAABEMOWİN languages rearranged as “MAN-İSHİAN-BEİ-OVUAN” LANGUAGES, reveals the Turkish saying “MEN IŞIYAN BEY ÖVÜEN DİLİ” (MEN IŞIYAN BEY EVLERİN DİLİ) meaning “I am the language of the House of Shining Lord”, that is, “I am the language of the House of Sun Lord”, “I am the language of the House of Günhan” which is the “Günhan Dili” (Güneş Dili) in Turkish. But GÜNEŞ DİLİ is the TURKİSH language which was the language of the ancient Turanıan Tur/Turk/Oğuz peoples! Turkish was a world wide spoken language contrary to denials, political sophistry and iğnorance! Throughout this study, I investigated about fifty Ojibwe (Chippewa) Language words. My decipherments of these native OJIBWE words has shown, without question, that these words were made up from Turkis words and phrases. I showed that each word is a name for a concept, but the concept itself is described in TURKISH sayings. Turkish sayings are phrases that describe a given concept with the words of the monosyllabic and agglutinative language of Turkish. In Turkish sayings, words are represented with monosyllabic words as well as words that are formed by adding Turkish language suffixes to a root word, and thus, adding suffixes gives refined meanings to each word. However, in Turkish, the words in a saying (phrase) are not concatenated as is done, for example, in the Ojibwe (Chippewa) word “ANİSHİNAABEG”. This word describes and identifies the Algonquian people, yet the word is made into such a complex and convoluted form that it does not look or sound like any Turkish languages or other known languages. But, when we separate this Ojibwe (Chippewa) word into smaller Turkish parts, such as: “AN-İSHİAN-BEG”, then, the word comes alive with meaning and explains itself in a Turkish phrase that means “Sky Shining Lord”. The Turkish saying “AN-İSHİAN-BEG” describes the SUN and also the SUN believing ALGONQUIAN peoples! Since, the ALGONQUIAN language family is another name for the family of the Turanian Tur/Turk/Oguz Peoples, this description in Turkish is proper and fitting. The Turkish speaking and Sun believing Turanian Tur/Turk/Oguz peoples, in their titles, always identified themselves with ancient Turanian deity names! The English term CONCATENATED is defined as being “linked (things) together in a chain or series”. It is said that: "some words may be concatenated, such that certain sounds are omitted". In other words, by concatenating the words of an original Ojibwe phrase, the original Turanian identity of the Ojibwe sayings are lost. With such linguistic trickery, not only did the Native peoples of the Americas lose their ancient Turanian identity, language, religion and culture - but the world also was conned into the false belief that these native peoples were barbarians with a primitive language. The European missionaries restructured the native words and phrases in such a confused and disguised manner that neither people nor their language could identify with the Turkish language or with the Turanian people. The European invaders of the Americas, most likely, knew that there were some continents in the west of the Atlantic Ocean, and that the ancient Turanian Tur/Turk/Oguz Peoples were the first race to have gone there and make it one of their native lands! The European church establishments and their missionaries were well experienced in altering, restructuring, confusing and disguising the words and sayings of the Turkish language of the ancient Turanian Tur/Turk/Oguz peoples - in fabricating new languages for people whom the missionaries had converted to their new religion. When they went to the American continents and met the Native Americans, they had opportunity to convert them to Christianity and Aryanism. For this to happen, they used the same language confusion and alteration technique to come up with a new “language” for many Native groups in the continent. The natives were originally Turkish speaking Asiatic Tur/Turk/Oguz peoples and they could speak to each other and understand each other. With a newly fabricated “language” for many Native groups being taught to the young generations by the missionaries, the natives could no longer talk to or understand each other any more. This was the fragmentation of the native peoples. After all, the missionaries had received their religious order from Genesis 11 instructing them to confuse and destroy the first world-wide spoken language so that the native speakers of that language everywhere could not talk to and understand each other. The result of all these alterations was the transformation of the native people from an ancient Turanian identity to a new one.